An unfortunate trend accompanying the expansion of agricultural monocultures is that it occurs at the expense of surrounding natural vegetation which serves to add biodiversity to the landscape. One consequence of this trend is that the total amount of habitat available for beneficial arthropods and natural enemies of pests is decreasing at dramatic rates. The hypothetical impact of habitat fragmentation on the survival of natural enemies in agroecosystems is depicted in Figure 7. The implication of this habitat loss for the biological control of pests may be serious in light of scientific data demonstrating increased abundance of insect pests in homogeneous agricultural landscapes (Altieri and Letourneau, 1982). Emerging data demonstrate that there is enhancement of natural enemies and more effective biological control where wild vegetation remains at field edges and in association with crops (Altieri, 1994). These habitats may be more important as overwintering sites for predators, or they may provide increased resources, such as pollen and nectar for parasitoids and predators from flowering plants (Landis, 1994). Hedgerows and other landscape features have received significant attention in Europe regarding their effects on arthropod distribution and abundance in adjacent crop fields (Fry, 1995). There is wide acceptance of the importance of wild vegetation field margins as reservoirs of natural enemies of crop pests (van Emden, 1965). Many studies have documented the movement of beneficial arthropods from margins into crops, and higher biological control is usually observed in crop rows close to wild vegetation edges than in rows in the center of the fields (Altieri, 1994). In many cases, weeds and other natural vegetation around crop fields harbor alternative hosts/prey for natural enemies, thus providing seasonal resources to bridge gaps in the life cycles of entomophagous insects and crop pests (Altieri and Whitcomb, 1979). A classic case is that of the egg parasitoid wasp, Anagrus epos, whose effectiveness in regulating the grape leafhopper, Erythroneura elegantula, was increased greatly in vineyards near areas invaded by wild blackberry (Rubus sp.). This plant supports an alternative leafhopper (Dikrella cruentata) which breeds in its leaves in winter (Doutt and Nakata, 1973). Recent studies show that French prune orchards adjacent to vineyards provide overwintering refuges for Anagrus and early benefits of parasitism are promoted in vineyards with prune trees planted upwind from the vineyard. Research in northern California showed a considerable amount of movement of entomophagous insects from woodlands into adjacent apple orchards, with organically managed orchards exhibiting a higher rate of natural enemy colonization from bordering woodlands than orchards sprayed with insecticides (Altieri and Schmidt, 1986). Several predators and parasites collected in the woodland edges were intercepted at the orchard interfaces and later collected within the orchards, suggesting that the development of apple orchard beneficial arthropod communities are influenced by the type of surrounding natural vegetation. Recent developments in temperate agriculture to encourage predators while reducing pesticide applications have included use of beetle banks, flowering strips, and conservation headlands. In Britain, several hundred potentially beneficial species of predators and parasites may live in or by cereal crops. Most of these are killed when the crops are sprayed to control pests. But if the field habitat is manipulated to increase plant diversity, then the need for spraying pesticides can be greatly reduced. When grass strips are constructed across large fields, then predatory beetles proliferate and can get to the field centers, the regions where aphid populations are greatest (Wratten, 1988). The cost of establishing a 400-m bank in a 20-ha field is about $200, including cultivation, grass seed, and loss of crop. One aphid spray costs $750 across the same field, plus the cost of yield reduction due to aphid infestation. Despite the above findings, no major efforts are under way in the world to diversify agroecosystems at the landscape level with natural edges or windbreaks composed of flowering species that act as insectary plants. Experiments of this sort would fill an information gap on how changes in the physical and biodiversity layout of agroecosystems would affect the distribution and abundance of the whole complex community of pests and beneficial insects. possible to determine the length, width, distance, and frequency of corridors needed to maintain a level of functional biodiversity which will provide the necessary crop protection without the need of pesticides. 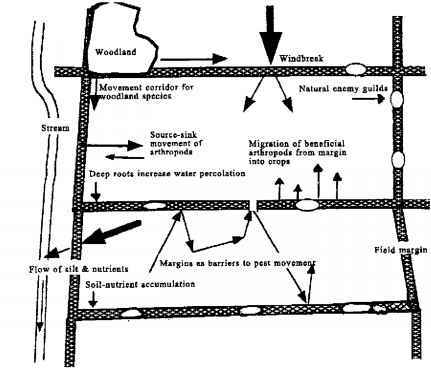 A system of corridors can also have positive effects on the overall system by interrupting inoculum dispersion, serving as barriers to insect pest movement, producing biomass for soil fertility, decreasing outflow of silt and nutrients, and by modifying microclimate through interception of air currents (Figure 8). 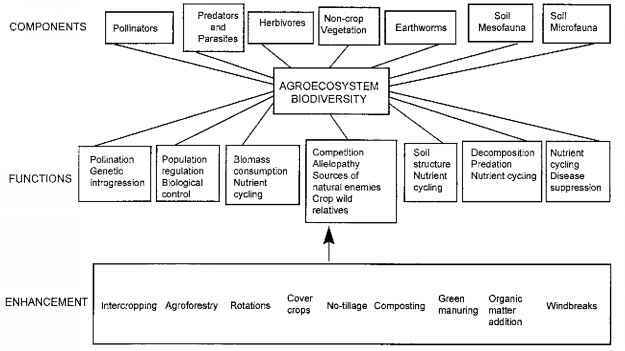 The most important aspect is that corridor manipulation can be a crucial first step in reintroducing biodiversity into large-scale monocultures, thus facilitating the biological restructuring of agroecosystems for the conversion to agroecological management.